Over the years, doctors, dermatologists and other medical representatives have stressed the importance of applying sunscreen to the skin and protecting it from dangerous radiations, not only during the summer, but also during winter (when the sun can be more harmful than you think). The fact that sunscreen protects us from getting sun burns is more than obvious, but scientists have also wondered if it can protect us against cancer. And they say that found the answer and applying sunscreen protects the superhero gene. A research team headed by Dr. Elke Hacker, from QUT’s AusSun Research Lab, has found that sunscreen offers 100% protection against all three forms of skin cancer: BCC (basal cell carcinoma), SCC (squamous cell carcinoma), and malignant melanoma. Not only that, but sunscreen acts like a protective shield for an important gene – p53, a gene that works to prevent cancer. “As soon as our skin becomes sun-damaged, the p53 gene goes to work repairing that damage and thereby preventing skin cancer from occurring. But over time, if skin is burnt regularly the p53 gene mutates and can no longer do the job it was intended for – it no longer repairs sun-damaged skin and without this protection skin cancers are far more likely to occur.” So, using sun screen will not only protect you from unpleasant sun burns, but it’s guaranteed to protect you against skin cancer. 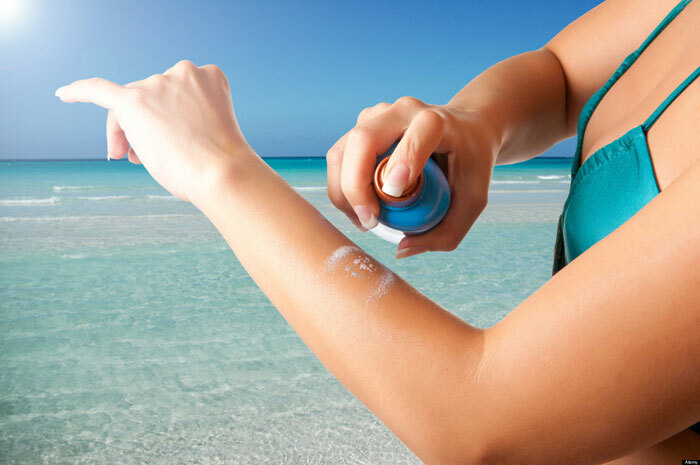 The active ingredients in sunscreen lotions deteriorate over time and this leads to a lack of protection for your skin. Moreover, American dermatologist Lisa Garner explains that once opened, the container is likely to become contaminated with microbes, because preservatives lose their properties. Keep the cream in a shaded area and use it during a single year. Women tend to use makeup and say there is no point in using sunscreen, because your face is protected anyway. It is wrong for at least two reasons. The first is the fact that the rest of your body is not adequately protected. The second is the fact that the make-up, i.e. foundation, provides sufficient protection only if applied in large quantities. In addition, it is diluted or dissolved throughout the day. So, before applying foundation, make sure you use proper sunscreen. When your health is at stake, you should apply sun lotion in sufficient quantities. Make sure every part of the body exposed to UV light is protected by a layer of cream, even when the sun is not shining in the sky. When you sit in the sun, sunscreen helps for maximum two hours after application. It is therefore very important to always have it at hand and to not forget to protect yourself whenever necessary, especially if you sweat excessively or if you go into the water. Dermatologists recommend a cream with an SPF factor (Sun Protection Factor) of at least 30. That does not mean that those lotions with SPF 60 can provide twice as much protection or last twice as long. If it is applied correctly, SPF 30 cream can provide 96% protection against sunburn, because no lotion you use will protect you 100%.